The 3DS has more tools than then N64, but Nintendo is staying tight lipped about how it plans to use them. Nintendo boss Satoru Iwata says that the 3DS version of Ocarina of Time is "crammed" with features that the original didn't have. Unfortunately, he says that Nintendo isn't going to reveal what these new features actually are until much closer to the game's release in the summer. Nintendo released Ocarina of Time for the N64 back in 1998. 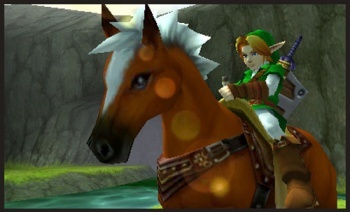 It was the first Zelda game to be made in 3D, and remains one of the most highly regarded videogames to this day. The new version is scheduled to come out in June, and until then, we can only speculate on what the changes might be. The 3DS has a number of hardware features that the N64 lacked, like its touch screen and gyroscope, and Nintendo has revealed a few of the refinements we can expect to see. The graphics and the inventory screen are much improved - a real boon for navigating some of the games temples - and is using the 3DS's gyroscope to aim weapons like the slingshot. The 3DS also has a Wi-Fi connection, which could come into use, particularly if Nintendo expands the collection element with the Skulltulas. Of course, Nintendo could pretty much leave the game alone and it would have a winner on its hands. If it's able to streamline, refine, and enhance the experience, however, then that can only be a good thing.